REVIEW: Is ‘Robin Hood’ worth the gold? When remaking a folktale that many adore, at least make it bigger and better than the last. 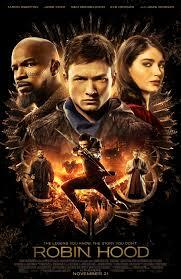 Robin Hood, a movie with a good storyline, does not live up to high expectations due to poor execution of the plot. In my opinion, this movie was not one of my favorites. Going into the movie I had high expectations but was disappointed with what I saw on the screen. I found myself throughout the movie being able to predict what would happen next. In other words, there were no plot twists. At times it seemed that the director was trying too hard to grab the attention of viewers, but fell short of the intensity that I was hoping for. For example, in many serious scenes between Robin and Marian (Eve Hewson), Robin’s love interest, there was good potential, but there was a major lack of emotional tension. Without spoiling anything, this movie is about a young lord, Robin of Loxley, who is sent off to war. After being injured in battle he returns to find a whole new world, instead of the peaceful life he left. The Sheriff is terrorizing the town and forcing the people to give him money. When Robin hears of this he is in a pessimistic state, until a man he met in the war emboldens him to fight for what he knows is right. This version of Robin Hood stars two prominent actors, Taron Egerton (Robin Hood) and Jamie Foxx (John). Scenes with these two actors are pretty intriguing but are surrounded by mostly mediocre scenes, that did not feel like the same amount of effort was put in. In all, this film was quite disappointing, for someone who went into the movie with high expectations. This movie was not exactly what I wanted it to be, and I feel if the crew would have taken more time and worked harder to perfect it could have been very good. I would give this movie 2.5 stars.